Microsoft is developing new Xbox consoles, the company's head of Xbox said on stage at E3 2018 today. 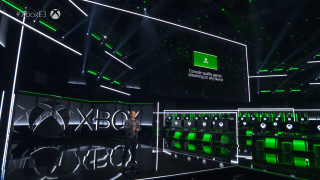 "Our hardware team is deep into developing the next generation of Xbox consoles, where we will once again deliver on our commitment to set the benchmark for console gaming," said Phil Spencer, master of ceremonies for Microsoft's Xbox E3 showcase. No details on the hardware were offered, including when we might expect it. But despite the lack of details, it's likely reassuring for Xbox fans that there will be a followup to the Xbox One X. Not that they had much reason to doubt there would be. Console lifecycles can span several years, and though it'd be a little early, by November 2019 the Xbox One X will be two years old, so a refresh could make sense then. It could be that Xbox looks to knock off the PlayStation 5 when it's launched with a shiny new console or consoles of its own. But, again, we could still be a few years out from that happening. We'll likely hear more about Microsoft's future Xbox console plans at E3 2019, so stay tuned till next year. Until then, get your fill of the latest Xbox news on games like Halo 6 and Forza Horizon 4, all fresh from this year's E3.